Rio de Janeiro is blessed with kilometers of golden coastlinethat foster the beach-centric lifestyle the city is so famed for. As romantic visions of sipping on cold caipirinhas in beachside bars come to mind, here are the top venues worth checking out to make those seaside cocktails a reality. Bar Astor’s concept was born in São Paulo and modelled after traditional Brazilian botecos (local bars) before finally coming to Rio as a bar that is simultaneously relaxed and sophisticated. The large transparent walls on the outside patio provide sweeping views over Ipanema Beach and early arrivers will be treated to one of the city’s most spectacular sunsets. While the food menu includes oysters and modern takes on classic Brazilian cuisine, the bar’s main attraction is its five variations on the classic gin and tonic. 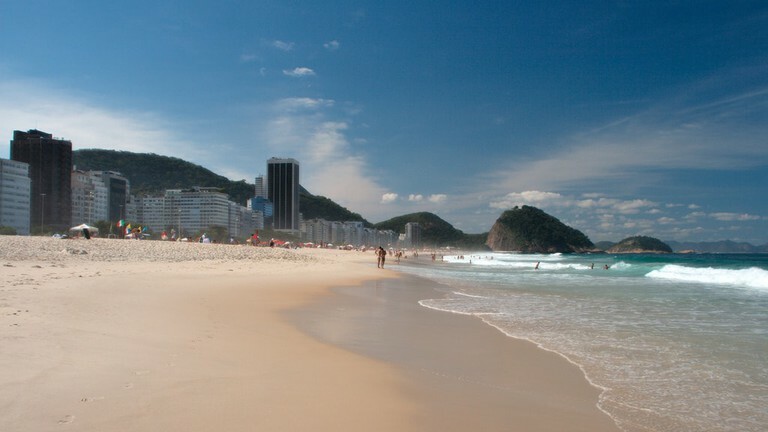 Gávea Beach Club is found in São Conrado, a wealthy residential neighborhood that neighbors Leblon and has the casual air of the beach kiosks in Copacabana with the comfort of a small restaurant. The cushioned seats, as opposed to plastic chairs, are a welcome addition to the fresh seafood, Brazilian cuisine, and chilled beers. However, the real star is the view over the white shores of São Conrado and the twinkling, endless sea. Part of the successful chain of local RIBA bars and restaurants, RIBA Praia is a luxury version of a standard beach kiosk with a privileged location on Leblon’s beach, one of the most upscale and beautiful spots in Rio. The tempting appetizers include oysters and lobster and drinks vary from cold beers to bottles of champagne. Though it’s a lively social spot to enjoy a break from the street parties during Carnival, be prepared to dig a little deep when the bill comes. There are few things more Brazilian than enjoying skewered meat and chilled beers next to the beach, which is exactly what Kiosk Espetto Carioca is all about. Tucked away in the Leme neighborhood, the kiosk-bar has an entire corner of the beach to itself and pairs its panoramic sea views with live Brazilian music to create an atmospheric setting. This casual environment makes it the perfect spot to go for drinks and snacks after visiting the beach and you won’t have to fret about arriving in flip-flops with sandy feet. Located on the rooftop of the affluent Pestana Hotel, Deck Bar is an open-air bar that boasts one of the best views in Rio de Janeiro. Its high vantage point provides sweeping views over Leme and Copacabana that stretch out across the seemingly endless ocean. On the weekends, live DJs play various sets that include dance and electronic music, and the bar keeps the party going with potent cocktails and delicious snacks. The YNDÚ Beach Lounge is located in Leblon and brings a party spirit to the neighborhood’s otherwise relaxed and laid-back setting. Though the tables and chairs spread out across the sand make the bar seem casual, it is a place to see and be seen. The drinks menu includes an impressive selection of caipirinhas and cocktails and on the weekends, live DJs play music throughout the evening with great house and electronic sets. During the day, the bar hosts yoga classes on the sand. Not to be confused with Deck Bar, Deck is a restaurant on the seafront of Copacabana. Despite its privileged location and stunning views over Copacabana Beach, the prices at Deck are remarkably reasonable with a buffet of pizza for less than $8. However, the real joy at Deck is sitting outside and enjoying some cold beers while taking in the whirlwind of activity on Copacabana Beach.